I know if you're following me in any variety of social media, it looks like I'm simply hanging out with Don Williams and the Studley Tool Cabinet and Workbench. . .
you'd kinda be right about that. 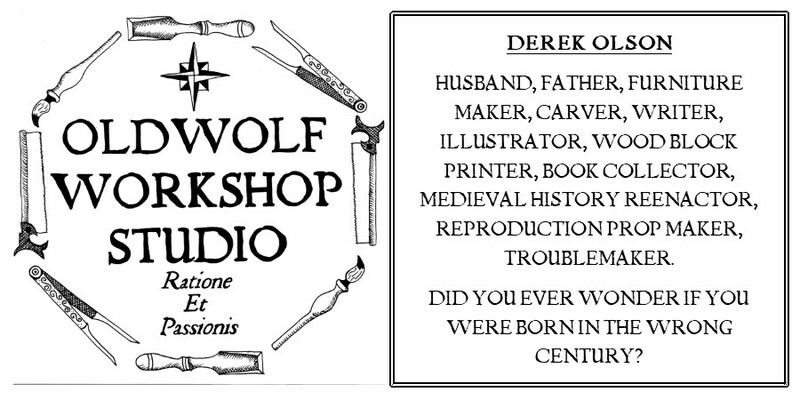 But I'm also using my downtime from docent duty to focus in the laser on this little medieval book of mine. After all a few weeks ago I gathered some incredible research and I'm ready to start filling in the initial framework. There is still more research to do along the way, but yesterday evening I had a small but satisfying break through. 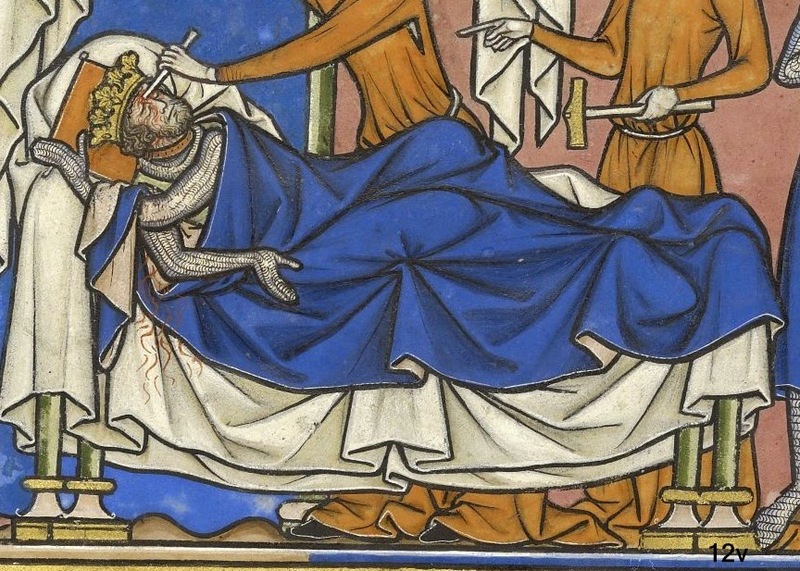 The bed shown in the Morgan Bible has been an issue for me since just after identifying the thirteen instances it shows up. Why is it so problematic? The bed clothes hide most of the bed in nearly all the instances. The best you get to see is the feet. It's a little maddening in the fact that it doesn't show anything much for me to work from. But research is magic. Tonight I was reviewing my notes and I found a trail to follow. 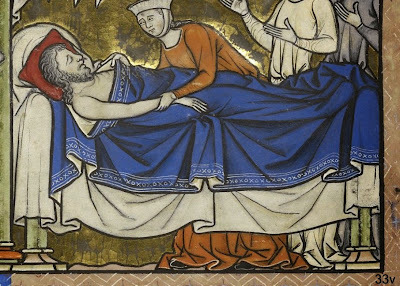 Under my research on beds I'd written "Famous example from Chartres" Offhand I wasn't sure what Chartres was. The power of the internet is great and soon I'd found that Chartres Cathedral is a medieval Gothic cathedral built near Paris France around 1194 and completed around 1220. It is nearly complete in it's original state, almost untouched by hardships. And the stained glass windows are exquisite. In a stained glass window panel called the Charlemagne panel. There I finally found a solid answer. 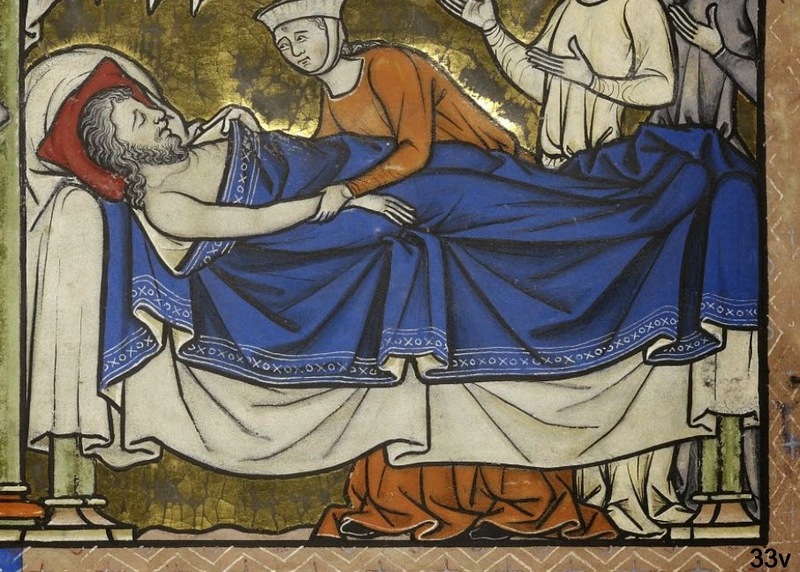 My research has concentrated on other illuminated manuscripts, now I'll have to spend some time with stained glass windows as well. It's a heavy burden. . . The bed without the bedclothes is fairly close to what I was picturing in my head and planned out on paper. Still, I wasn't close enough, I'll start the measured drawings again from scratch once I get back to my drafting table. 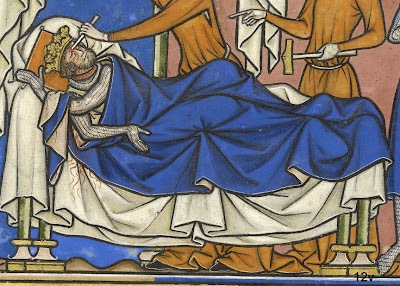 A lot of those who've studied the Morgan Bible note how the artistic interpretations inside are different from other manuscripts at the time. The popular speculation is they were actually mural painters, based on recollections of similar murals that had been painted at the time and preserved until the 20th century. I have a different speculation. 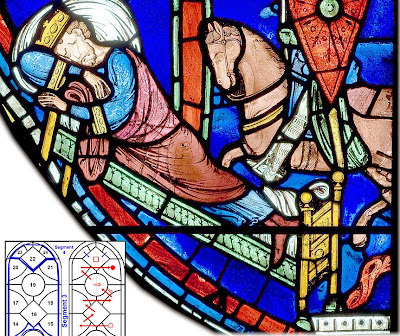 Not possessing the advantage of witnessing the murals, I see similar artistic quality and work in the stained glasses of Chartres Cathedral and Sainte Chapelle.. What does a stained glass artisan do when the work is light? or they cannot travel for a while to work on a new cathedral? Settle down for a bit and work for a Scriptorum creating manuscripts. I wonder if the idea has been entertained. I will have to leave it for the moment though. 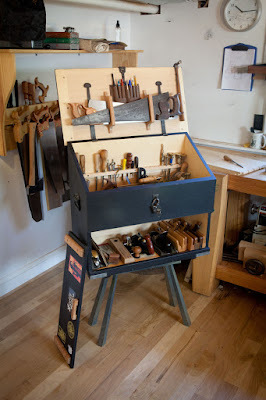 For the rest of the day I get to help pack up and wrap up the Studley Tool Cabinet, Workbench, and all the tools for it's return journey to the owner. Yet another burden. . . .